The first OnPar Touchscreen GPS was launched to the golf community at the 2009 PGA Merchandise Show with resounding success. In using the most advanced technology, this next generation GPS product has been described as "Your own Personal Caddie." It allows you to View each golf hole; Track every shot; and Know your game better. Hand Held GPS Products have evolved, so will your game. Savant GPS, LLC, is a Houston based Golf Technology Company. It designed, built, manufacturered, and distributes the "Next Generation" golf GPS, OnPar. OnPar is a registered trademark of Savant GPS, LLC. 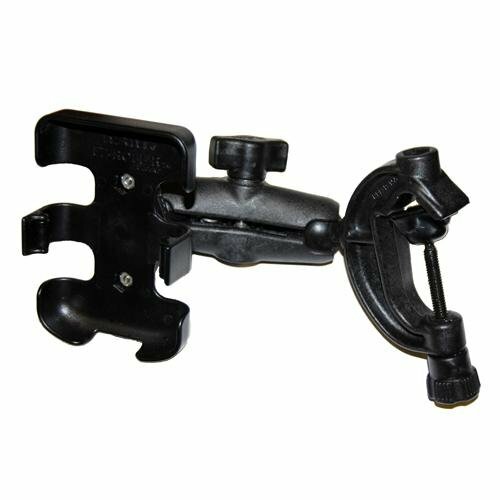 OnPar Temporary Cart Mount is the prefect accessory for securing your GPS device onto the golf cart, at home or when traveling on that golf trip. OnPar Temporary Cart Mount provides a secure, accessable method of viewing your OnPar GPS from the cart, or pull cart. If you have any questions about this product by OnPar, contact us by completing and submitting the form below. If you are looking for a specif part number, please include it with your message.